Imagine being an elementary school boy. You are forced to move to a new country. You are thrown into a boarding type school. You know no one. You have no family. You have only one possession. You are a Holocaust survivor. Now imagine again being an elementary school boy. You attend a boarding school filled with bullies. You talk about your father all the time. You have a significant speech impediment. You just met Daniel and Aaron. Greenhorn is a short read at only forty-eight pages, but huge issues are found within those pages. While it seems that the Holocaust would be a major theme here, it really comes across as just a background issue. The more intricate themes are about bullying, belonging, self-discovery and friendship. What is brought forth immediately, and throughout the book, is the name calling and bullying that was common for the 1940’s Brooklyn. I was taken back by this while in the read, but after realizing that is what life was like in that time, it came together for me. Linked, as a result of the bullying from other students, Aaron (has a speech impediment) and Daniel (the Holocaust survivor) find a friendship. Its that sense of belonging in a group that helps these characters survive their time within the school. I can’t divulge what’s in the box. No spoiler alert here. Just read the book. Not being Jewish, or knowing much about the Jewish culture, I found it hard to understand many of the words used. However, there is a vocabulary list of these words and I would strongly recommend having the students learn those before reading. It will definitely enhance the readers comprehension of the events. The illustrations enhance the reading material and give fourth grade readers a nice break within the pages. The publisher, NewSouth, has made an extensive Discussion Guide for families and Classroom Guide for teachers (http://www.newsouthbooks.com/greenhorn). 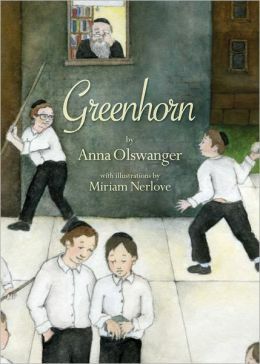 When you are ready to introduce the Holocaust to your students, Greenhorn will bring the students in gently.